Crop dusting is one technique used to spread pesticides on agricultural lands in the Albemarle Sound region. 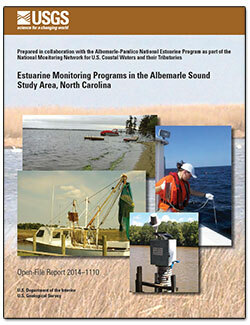 The Albemarle Sound region was selected in 2012 as one of two demonstration sites in the Nation to test and improve the design of the National Water Quality Monitoring Council’s National Monitoring Network (NMN) for U.S. Coastal Waters and Tributaries. The goal of the NMN for U.S. Coastal Waters and Tributaries is to provide information about the health of our oceans, coastal ecosystems, and inland influences on coastal waters for improved resource management. ► SA WSC home page. This project was conducted in two phases. The first phase was an occurrence and distribution study to assess nutrients, metals, pesticides, cyanotoxins, and phytoplankton communities in the Albemarle Sound during the summer of 2012 at 34 sites in Albemarle Sound, nearby sounds, and various tributaries. The second phase consisted of monthly sampling over a year (March 2013 through February 2014) to assess seasonality in a more limited set of constituents including nutrients, cyanotoxins, and phytoplankton communities at a subset (eight) of the sites sampled in the first phase. Albemarle Sound is a shallow, low-salinity, high-turbidity estuary in North Carolina. Freshwater inputs dominate this lagoonal estuary system that is separated from the ocean by a chain of barrier islands. The Elizabeth City waterfront is one of the many historic downtowns located on the Albemarle Sound. The Albemarle Sound supports several important commercial and recreational fisheries, but current populations are well below historic levels for many species. Several portions of the Sound, including the Chowan and Roanoke Rivers, were recently nominated as strategic habitat areas for these fisheries. Managers are concerned about contaminants in the water, sediment, and biota in these strategic habitat areas. Additionally, an understanding is needed of the ecological effects that may result as the sea-level rises in this low-lying system. A Water-Quality Monitoring Network for Albemarle Sound is being developed to provide data to examine critical water-quality management issues as a pilot study of the National Monitoring Network for U.S. Coastal Waters and their Tributaries. The network is an integrated, multidisciplinary, and multi-organizational program using multiple sources of data to assess the health of our coastal waters, coastal ecosystems and inland influences on coastal waters for improved resource management. We have worked with our partners to identify critical management issues in the Albemarle. One of the most critical issues is the decline of important fisheries including river herring, shad, Atlantic and shortnose sturgeon, and blue crab. Management efforts for these fisheries are underway, but their success depends on understanding what may be preventing or reducing recovery efforts. While overfishing was probably the cause of diminished fish stocks in the past, moratoriums on fishing have not been able to improve recovery efforts for several species of concern. It is possible that recovery efforts are less successful due to water quality impairment from eutrophication, noxious algal blooms, contaminants in the bed sediment or water column, and hypoxic and anoxic conditions. Improved monitoring and identification of contaminants in the water, sediment and biota will help identify factors impacting the ecology of the Sound and improve the ability of managers to make appropriate decisions regarding their restoration and recovery efforts. Poor water quality can cause the closure of designated shellfish areas. Monitoring water, sediment, and biota in the sound allows scientists to provide relevant information on the current status of the Sound. Data can be compared to water quality standards to determine if waters are impaired or serve as one of many data points needed for assessing long-term trends in environmental quality. The euphotic zone was sampled for phytoplankton, algal toxins, and other water quality parameters during summer of 2012. Phytoplankton community data will help characterize food availability by documenting the community structure of the primary producers in the food web. Phytoplankton are integrators of water quality and phytoplankton community data can be used to help identify potential sources of contaminants affecting water quality in the Sound and its tributaries. In addition to sampling phytoplankton, water samples were screened for the presence of cyanotoxins mycrocystin-LR, cylindrospermopsinsm, saxitoxin, and anatoxin, and the pesticides atrazine and glyphosate. Nutrients, metals, total suspended solids, chlorophyll a concentrations, and other ancillary data were collected in order to characterize relationships between water quality and community structure. This information will improve our understanding of the spatial and temporal variability of nutrient and phytoplankton communities in the Sound. Short and long-term temporal variability will be addressed by collecting samples in both July and August, and by comparing the results from summer 2012 with historic datasets from the late 1980s and early 1990s. The data will allow us to begin to make inferences on how community structure is related to water-quality conditions and food availability in the Albemarle Sound. This sampling fills a monitoring gap for the Albemarle Sound because a soundwide synoptic of phytoplankton has not been conducted since the late 1980's and a soundwide synoptic of cyanotoxins has never been conducted. In Fall of 2012, bottom sediment at 20 sites in Albemarle Sound and tributary rivers were sampled in order to estimate the occurrence, distribution, and total recoverable concentration of 28 metals that are potentially toxic to benthic organisms. Total organic carbon and particle size analysis were also determined for all samples. Sharon Fitgerald, USGS, sampling bottom sedimentin the Albemarle Sound for metals and grain size. Total recoverable metals included Silver, Aluminum, Arsenic, Boron, Barium, Berylium, Calcium, Cadmium, Cobalt, Chromium, Copper, Iron, Potassium, Magnesium, Manganese, Molybdenum, Sodium, Nickel, Lead, Antimony, Selenium, Thorium, Thallium, Uranium, Vanadium, Tungsten, and Zinc. In Summer of 2012, 40 water quality samples were collected at 30 sites in partnership with the NC Division of Water Quality, NC Division of Marine Fisheries, and the U.S. Fish and Wildlife Service. Samples were screened for the pesticides atrazine and glyphosate. This information will help characterize the distribution of pesticides in the water column and direct future pesticide sampling efforts. Sites sampled for phytoplankton in Summer of 2012. Sites were co-located with exisiting monitoring sites maintained by the state when possible. A subset of 20 sites were sampled for bed sediment in October of 2012.